The word pesticide has become a nasty term, and rightly so. While one or two generations enjoyed attractive fruits and vegetables they were closer to the apple from the story of Sleeping Beauty. Laced with toxins that harm the body, the pesticide chemicals that were at one time freely sprayed are frowned upon today. If you think that we are pesticide free, you are wrong, the chemicals are still there and the caution remains the same. If you use a lawn company and they put a sign on your lawn to caution animals and children after they spray. You might want to get a list of the chemicals they are dumping on your grass. According to the EPA there are about twenty eight pesticides used for home, food and general pest control. Of these, approximately forty percent are listed in the category of concern for health of humans including probably or possible carcinogens. 350 million pounds per year are sprayed, dabbed, dumped or washed onto surfaces that we touch, walk on and even eat. 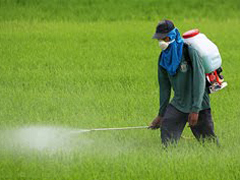 There have been studies of a selection of nineteen pesticides and eighteen of those chosen showed test results showed health effects on humans including: headaches, skin irritation, eye irritation, fatigue, respiratory tract problems, vomiting and dizziness. All side effects are completely dependent upon the exposure level of a pesticide, but, a sensitive individual can have health effects with smaller quantities of pesticides. These same nineteen were also listed as potential hazards for genetic problems, birth defects and possible increase for the risk of cancer. Pesticides may be a deterrent for the little roaches, ants and critters but they are also getting on the feet of our children as well as our beloved pets. The pets return home, walk throughout the house and spread the pesticide residue. The children walk on it and now they are contaminated. Our pets lick their paws and now they have ingested the toxins. Areas that have a lot of rain and good drainage will probably find pesticides have drained into the water systems. If there are layers of natural drainage such as rocks, sand and undergrowth, this will reduce the parts per million pesticides count in a naturally refining method. There are farming communities around the world that have opted for natural or alternative pest deterrents and continue to run the water through a natural filter. This removes any fertilizer residues, even if they are organic. One of the major problems with pesticides is that they do not remain where they are sprayed. This is called pesticide drift. Many people that have opted for growing their own organic produce in their yard may be shocked to find out that the pesticide the neighbor had sprayed on their lawn has drifted to the tomatoes that are being so carefully (and organically) tended. Pesticide drift is well known by the EPA (Environmental Protection Agency) and it has led to restrictions of spraying of some of the chemicals anywhere near schools or any medical institution. There is a cost for perfection, but using toxic pesticides is too high of a price to pay. Posted on November 29th under Global Ecology.